In this paper, we present an analysis of more than 500 K comments from open-source repositories of software systems developed using agile methodologies. Our aim is to empirically determine how developers interact with each other under certain psychological conditions generated by politeness, sentiment and emotion expressed within developers’ comments. Developers involved in an open-source projects do not usually know each other; they mainly communicate through mailing lists, chat, and tools such as issue tracking systems. The way in which they communicate affects the development process and the productivity of the people involved in the project. We evaluated politeness, sentiment and emotions of comments posted by agile developers and studied the communication flow to understand how they interacted in the presence of impolite and negative comments (and vice versa). Our analysis shows that “firefighters” prevail. When in presence of impolite or negative comments, the probability of the next comment being impolite or negative is 13 % and 25 %, respectively; ANGER however, has a probability of 40 % of being followed by a further ANGER comment. The result could help managers take control the development phases of a system, since social aspects can seriously affect a developer’s productivity. In a distributed agile environment this may have a particular resonance. The study of emotions and psychological status of developers and people involved in the software-building system is gaining the attention of both practitioners and researchers . Feldt et al. focused on personality as one important psychometric factor and presented initial results from an empirical study investigating the correlation between personality and attitudes to software engineering processes and tools. Software is a complex artefact which requires sharing of knowledge, team building and exchange of opinion between people. While it has been possible to standardise classical industrial processes (e.g., car production), it is still difficult to standardise software production. Immateriality plays a major role in the complexity of software and despite attempts to standardise the software production process, software engineering is still a challenging and open field. There are too many constraints to take into account. Developers build an artefact that will be executed on a machine; software metrics, design patterns, micro patterns and good practices help to increase the quality of a software [4, 6], but developers are humans and prone to human sensitivities. Coordinating and structuring developer teams is a vital activity for software companies  and dynamics within a team have a direct influence on group success; on the other hand, social aspects are intangible elements which, if monitored, can help the team in reaching its goals. Researchers are increasingly focusing their effort on understanding how the human aspects of a technical discipline can affect the final results [3, 7, 11]. Open-source development usually involves developers that voluntarily participate in a project by contributing with code. The management of such developers could even be more complex than the management of a team within a company, since developers are not in the same place at the same time and coordination becomes more difficult. The absence of face-to-face communication mandates the use of mailing lists, electronic boards, or specific tools such as Issue Tracking Systems. Being rude when writing a comment or replying to a contributor can affect the cohesion of the group and the successfulness of a project; equally a respectful environment is an incentive for new contributors joining the project [13, 20, 24]. Do developers change behaviour in the context of impolite/negative comments? What is the probability of shifting from comments holding positive emotions to comments holding negative emotion? The remainder of this paper is structured as follows: In the next section, we provide a summary of related work. Section 3 describes the dataset used for this study and our approach/rationale to evaluate affectiveness of comments posted by developers. In Sect. 4, we present the results and elaborate on the research questions we address. Section 5 discusses the threats to validity. Finally, we summarize the study findings in Sect. 6. Several recent studies have demonstrated the importance and relationship of productivity and quality to human aspects associated with the software development process. Ortu et al. studied the effect of politeness  and emotions  on the time required to fix any given issue. The authors demonstrated that emotions did have an effect on the issue fixing time. Research has focused on understanding how the human aspects of a technical discipline can affect final results [3, 7, 11], and the effect of politeness [14, 23, 25]. The Manifesto for Agile Development indicates that people and communications are more essential than procedures and tools . Several recent studies have demonstrated the importance and relationship of productivity and quality to human aspects associated with the software development process. Ortu et al. studied the effect of politeness  and emotions  on the time required to fix any given issue. The authors demonstrated that emotions did have an effect on the issue fixing time. Steinmacher et al. analyzed social barriers that obstructed first contributions of newcomers (new developers joining an open-source project). The study indicated how impolite answers were considered as a barrier by newcomers. These barriers were identified through a systematic literature review, responses collected from open source project contributors and students contributing to open source projects. Rigby et al. analyzed, using a psychometrically-based linguistic analysis tool, the five big personality traits of software developers in the Apache httpd server mailing list. The authors found that the two developers that were responsible for the major Apache releases had similar personalities and their personalities were different from other developers. Bazzelli et al. analyzed questions and answers on stackoverflow.com to determine the developer personality traits, using the Linguistic Inquiry and Word Count . The authors found that the top reputed authors were more extroverted and expressed less negative emotions than authors of down voted posts. Gomez et al. performed an experiment to evaluate whether the level of extraversion in a team influenced the final quality of the software products obtained and the satisfaction perceived while this work was being carried out. Results indicated that when forming work teams, project managers should carry out a personality test in order to balance the amount of extraverted team members with those who are not extraverted. This would permit the team members to feel satisfied with the work carried out by the team without reducing the quality of the software products developed. Compared to the existing literature, the goal of this paper is to build Markov chain models which describe how developers interact in a distributed Agile environment evaluating politeness, sentiment and emotions. Such models provide a mathematical view of the behavioural aspects among developers. We built our dataset from fifteen open-source, publicly available projects from a dataset proposed by Ortu et al. . We selected the fifteen projects with the highest number of comments (from December 2002 to December 2013), from those projects which had a significant amount of activities in their agile kanban-boards. The projects were developed following agile practices (mainly continuous delivery and use of kanban-boards). Table 1 shows summary project statistics. Henceforward, we consider the term “affective metric” as a definition indicating all those measures linked to human aspects and obtained from text written by developers (i.e., comments posted on issue tracking systems). This study is based on the affective metrics (sentiment, politeness and emotions) used by Ortu et al. . The tool uses a lexicon approach based on a list of words to detect sentiment; SentiStrength was originally developed for the English language and was optimized for short social web texts. We used the tool to measure the sentiment of developers in issue comments. Value of -1 for comments marked as impolite. For each issue in our dataset, we built a temporal series of comments, and using the two tools we assigned a value of politeness and sentiment for each comment in the series. Next, for each issue, we calculated, starting from the first comment posted, the probability of having a polite/impolite/neutral following comment (for politeness), and a positive/neutral/negative comment (for sentiment). We thus calculated the probability of shifting from “polite” to “neutral” and vice versa; from “polite” to “impolite” and vice versa; finally, from “neutral” to “impolite” and vice versa. Emotion. 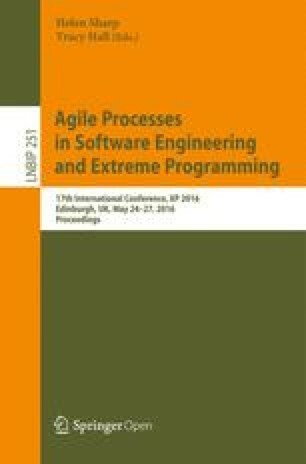 The presence of emotion in software engineering artifacts have been analysed by Murgia et al. . Ortu et al. provided a machine learning based approach for emotion detection in developers’ comments. We used the emotion detection tool provided by Ortu et al. to detect the presence of SADNESS, ANGER, JOY, LOVE and NEUTRAL. Markov Chains (MC) have been used to model behavioural aspects in social sciences [10, 21]. A Markov chain consists of K states and is a discrete-time stochastic process, a process that occurs in a series of time-steps in each of which a random choice is made. We built a MC for each affective metric: sentiment, politeness and emotion. Figure 1 shows the steps in building the politeness MC as an example for an issue report in which three developers posted five comments. As a first step, we used the politeness tool  to label each comment as POLITE, IMPOLITE or NEUTRAL. Next we collected the politeness labels of the issue report, considering the set of labels as a politeness sequences of N-1 pair-wise politeness-transitions ([P,N,I,I,P] in the example), where N is the number of comments in the issue report. In this example, the issue report has 4 transitions: polite-neutral, neutral-impolite, impolite-impolite and impolite-polite. Finally, we counted the frequency of each politeness-transition obtaining the corresponding MC. In our example, if we consider the POLITE state, we have two transition, P-P and P-N; hence, the transition from POLITE to IMPOLITE state will have a probability of 0 and the transitions to POLITE and IMPOLITE state probability 0.5. The MC for sentiment is built in a similar way to the politeness MC. The MC which models emotion transitions is slightly different; however, a comment can be polite, impolite or neutral when considering politeness, but it might contain more than one emotion. We used the emotion classifier proposed by Ortu et al. to analyze each comment and to attribute to it: Anger, Sadness, Joy and/or Love. For example, if a comment is labeled as containing ANGER and SADNESS and the next labeled as containing no emotion (NEUTRAL), then we consider two transitions ANGER-NEUTRAL and SADNESS-NEUTRAL. 4.1 Do Developers Change Behaviour in the Context of Impolite/Negative Comments? Motivation. Existing research has already explored links between productivity (as measured by issue fixing time) and discrete emotions, sentiment and politeness [13, 15]. The dynamic of an issue resolution involves complex interactions between different stakeholders such as users, developer and managers. A model able to describe such interactions could inform in the decision making process. The underlying assumption is that a model of social interaction can be used to understand the impact of a certain comment on the whole issue resolution discussion. Approach. As presented in Sect. 3.3, we built three MCs for politeness, sentiment and emotions to understand how developers reacted to impolite/negative comments when they discuss an issue resolution. Findings. Developers tended to answer to impolite/negative comments with a positive/negative comment with higher probability than impolite/negative comments. Figure 2 shows the Politeness’ MC describing the probability of changing from a state to another. The “neutral” state is quite stable. If a comment is classified as “neutral”, communication flow among the developers involved tends to stay neutral, with a 73 % probability. There is an 8 % probability of a state-shift from “neutral” to “impolite” and a 19 % probability of a state-shift from “neutral” to “polite”. Starting from a “polite” state, the probability of shifting to the “impolite” state is quite low, 6 %. There is a high probability of moving to the “neutral” state (61 %). The probability of staying in the same state is 32 %. Starting from an “impolite” state, the probability of moving to a “polite” state is 17 %. This is higher than the probability of moving from a “polite” state to “impolite” and is an indication that a positive attitude could be more contagious than a negative attitude. It is interesting to see that the probability of staying in an “impolite” state is only 13 % (far lower than the probabilities of staying in both “neutral” and “polite states), and that there is a 70 % of probability of a shift from “impolite” to “neutral”. Figure 3 shows the Sentiment MC which describes the probability of changing from one state to another. The “neutral” state in this case is also quite stable. If a comment is classified as “neutral”, communication flow among developers tends to stay neutral, with a 60 % probability. There is a 16 % probability of a state-shift from “neutral” to “negative” and a 24 % probability of a state-shift from “neutral” to “positive”. Starting from a “positive” state, the probability of a shift to the “negative” state is 14 %. The probability of a move to the “neutral” state is 55 %. The probability of staying in the same state is 31 %. From a “negative” state, the probability of moving to a “positive” state is 21 %. In this case, the value is higher than the probability of moving from a “positive” state to a “negative” one. The probability of staying in a “negative” state is 25 % (also lower than the probabilities of staying in both “neutral” and “positive” states), and that there is a 54 % probability to shift from “negative” to “neutral”. 4.2 What is the Probability of Shifting from Comments Holding Positive Emotions to Comments Holding Negative Emotion? Motivation. The first research question showed how agile developers tended to respond more positively than negatively when considering politeness and sentiment. It is interesting to analyze if the same behaviours occur for emotions. Approach. We built the MCs for emotions as presented in Sect. 3.3 to analyze the probabilities of shifting from an emotion to another when developers communicate. Findings. Negative emotions such as SADNESS and ANGER tend to be followed by negative emotions more than positive emotion are followed by positive emotions. Table 2 shows the emotion transitions matrix. As for previous MCs, the numbers represent the probability of a comment containing emotion X being followed by a comment containing emotion Y (e.g., a comment expressing SADNESS has a probability of 0.26 of being followed by another SADNESS comment). As confirmed by other studies , most of the comments expressing emotion are likely to be followed by NEUTRAL comments, with the exception of ANGER. Figure 4 is a graphical representation of the portion of Table 2 for the ANGER emotion showing it has probability of 0.4 of being followed by an ANGER comment against probability of 0.36 to be followed by a NEUTRAL comment. This represents an interesting finding which seems consistent with the common experience: negative emotions are more contagious than positive emotions. Several threats to validity need to be considered. Threats to external validity are related to generalisation of our conclusions. With regard to the system studied in this work, we considered only open-source systems and this could affect the generality of the study; our results are not meant to be representative of all environments or programming languages. Commercial software is typically developed using different platforms and technologies, with strict deadlines and cost limitations and by developers with different experience. Politeness, sentiment and emotions measures are approximations given the challenges of natural language and subtle phenomena like sarcasm. To deal with these threats, we used SentiStrength form measuring sentiment, Danescu et al.’s politeness tool  and Ortu et al. for measuring politeness. This is a threat to construct validity. Threats to internal validity concern confounding factors that could influence the obtained results. Since the comments used in this study were collected over an extended period from developers unaware of being subject to analysis, we are confident that the emotions we mined are genuine. This study is focused on text written by agile developers for developers. To correctly depict the affectiveness embedded in such comments, it is necessary to understand the developers’ dictionary and slang. This assumption is supported by Murgia et al. for measuring emotions. We are confident that the tools used for measuring sentiment and politeness however are equally reliable in the software engineering domain as in other domains. This paper presented an analysis of more than 500 K comments from open-source issue tracking system repositories. We empirically determined how agile developers interacted with each other under certain psychological conditions generated by politeness, sentiment and emotions of a comment posted on a issue tracking system. Results showed that when in the presence of impolite or negative comments, there is higher probability for the next comment to be neutral or polite (neutral or positive in case of sentiment) than impolite or negative. This fact demonstrates that developers, in the dataset considered for this study, tended to resolve conflicts instead of increasing negativity within the communication flow. This is not true when we consider emotions; negative emotions are more likely to be followed by negative emotions than positive. Markov models provide a mathematical description of developer behavioural aspects and the result could help managers take control the development phases of a system (expecially in a distributed environment), since social aspects can seriously affect a developer’s productivity. As future works we plan to investigate possible links existing between software metrics and emotions, to better understand the impact of affectiveness on software quality. The research presented in this paper was partly funded by the Engineering and Physical Sciences Research Council (EPSRC) of the UK under grant ref: EP/M024083/1.